Automated SEM-EDS can be used for foreign particulate matter testing, API-specific particle sizing and API morphology testing. Case studies with an MDI, a DPI and a nebulizer are presented. 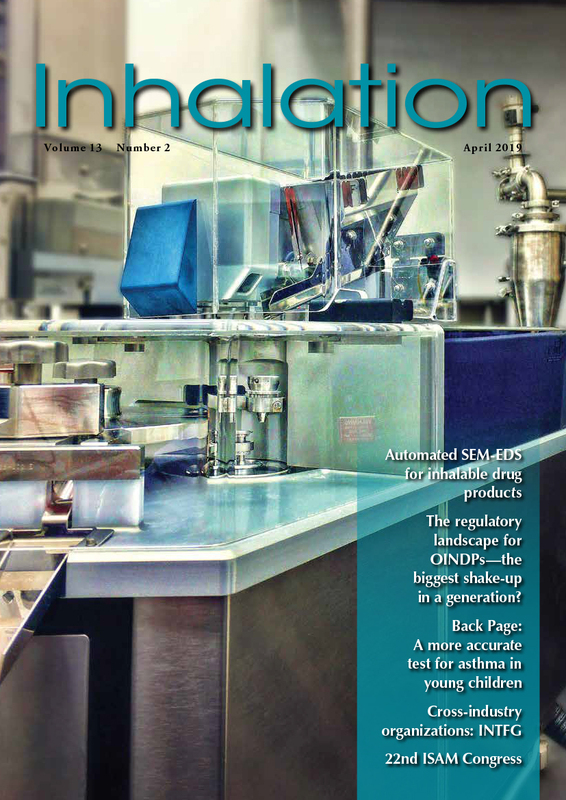 The regulatory landscape for OINDPs—the biggest shake-up in a generation? This article reviews ways in which globalization and generics are shaping regulation and practice. A key aim is to provide insight into how the overall approach to inhaled product testing and development is evolving. Scientists have tested a decision tool—The Pediatric Asthma Risk Score (PARS)—which they believe to be the most accurate, non-invasive method to date for prediction of asthma in young children. Due to the transition by AAPS to communities, it is pertinent to reflect on the history of the INTFG and identify the actions needed to keep the group strong. The 22nd Congress of the International Society for Aerosols in Medicine (ISAM) will be held in Montreux, Switzerland, May 26-29, 2019. The article should be technical and educational, but not promotional. It must be new, not previously published and must be at least 50% different from your previous articles or other articles you are simultaneously developing on the same subject. All discussions of products or technologies must be in an unbiased, non-promotional, educational manner. If your article discusses products that have been commercialized or are in development, please be aware of the following: Inhalation takes a very limited approach in discussing products, usually listing only product name, delivered drug name and company name, unless a description is provided by the particular company that owns a product, such as in a case study article or product news release. In that way, each company can choose the information it wishes to discuss or disclose about its own products, rather than being discussed by an outside party with no ability to comment prior to publication. However, if an article is a case study, presentation of a novel technology or news article written by the owner company or its representative such as a scientist or consultant, we are happy to consider all information or data they wish to disclose, provided it is presented in a fair-balanced manner. The article should be 2,500-3,500 words and must include at least five references or items for recommended reading. We encourage images and/or data tables and have space for three or four of them. We’re flexible about that number so let us know if you need more image space. We also like to publish an additional photo or illustration at the beginning of the article. Images should be sent as separate files that meet the following specifications: high resolution, 300 dpi at a size of 7 x 7 inches and in only JPG, TIF or EPS formats. Please be aware, due to copyrights, if you use figures or tables from articles that have been previously published in other journals, you must obtain permission from those journals in order to use the images. If you are an author on the published article in question, you may still need permission but there should be no fees from the other journal. If you are not an author and the other journal wants to charge you fees for usage, please contact us before proceeding. We do not want authors incurring costs in order to publish in Inhalation and there may be alternate approaches to citing information that could be used. Also, “open journals” do not charge for image use. If you have any questions or concerns, please contact us. All of our articles are peer-reviewed and must be accepted by our editorial board or a designated reviewer in order to be published. When you send us the article, it will go to a member of the board and we will coordinate communication between you. Once an article is accepted, we handle production and you will see the final article in layout before it goes to print or is published in the digital edition.